Mara Delta, the only listed Africa focused distribution fund to offer international property investors direct access to immediate high growth opportunities on the African continent outside of South Africa, today reported strong interim financial results for the six months ended 31 December 2016. “We are very pleased with declaring an interim dividend of 6.12 US$ cents per share despite some challenging geopolitical and economic headwinds. Our focus on counter party strength as well as our US dollar based leases has mitigated these risks to a large extent,” commented Bronwyn Corbett, Chief Executive. Mara Delta’s declared interim dividend of 6.12 US$ cents per share is in line with management’s guidance of between 2% and 4% on the prior year’s total distribution. “Our business model is based on structured investments underpinned by property assets. Debt is a major lever in this equation and the team successfully reduced our average weighted cost of capital by 0.42% to 5.80%, in line with our strategy to further diversify our sources of finance,” continued Corbett. The Company is in the process of obtaining new funding mechanisms that are anticipated to further reduce the cost of debt during the financial period to June 2017. Mara Delta’s loan to value increased to 51.0% from 48.9% in the prior reporting period. During the reporting period, Mara Delta increased its rental income by 24% from US$ 10.7 million to US$ 13.2 million on the back of asset acquisitions in the second half of the prior financial year. The Company currently has a yield accretive pipeline valued at US$ 244 million under transfer, which management says will increase revenue further as they come on stream. A binding sale agreement with Néréide Limited (“Néréide”) a wholly-owned subsidiary of Lux Island Resorts Limited (“Lux”) for the acquisition of the Tamassa Resort in Mauritius for a total consideration of the Euro equivalent of US$ 40.0 million. Subsequent to the sale, Tamassa Resort will be leased back to Néréide, guaranteed by Lux for an initial period of 10 years. The Euro denominated lease agreement will be on a triple net basis, meaning the tenant is responsible for the maintenance, the insurance and the utilities/municipal charges of the premises. The transaction is expected to be concluded in February 2017. Negotiations with New Mauritius Hotels Limited (“NMH”) were concluded during the reporting period for the acquisition of a 44.4% interest in an entity owning three hotels in Mauritius, namely Le Victoria, Le Canonnier and Le Mauricia for a total consideration of € 50 million. Similar to the Tamassa acquisition, the transaction will be on a sale and leaseback basis and will generate Euro denominated earnings from a 15-year triple net lease from NMH. Mara Delta will assume no operational risk. Mara Delta entered into an agreement to acquire the Imperial Health Sciences logistics warehouse in Nairobi, Kenya. The facility will be leased back to Imperial on a ten year triple net basis, denominated in US$ and guaranteed by Imperial Holdings Limited. The transaction is expected to be concluded by March 2017. On 7 December 2016 Mara Delta announced that it has concluded negotiations to acquire Mall de Tete, an 11 571 m2 newly opened retail centre located in Tete, Mozambique for a purchase consideration of US$ 24.9 million. 95% of the mall’s rentals are US dollar underpinned, with strong multi-national anchor tenants in the form of Shoprite and Choppies under long leases. 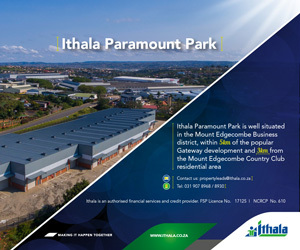 Other major tenants include Pep, Jet, Woolworths, Studio 88 and KFC. The transaction further diversifies our portfolio in Mozambique and is in line with our strategy of acquiring high quality rural retail centres in under-serviced markets. In addition to the above, the transfer of the Vale accommodation compound in Tete, Mozambique as well as the Cosmopolitan Mall in Lusaka, Zambia are pending subject to regulatory approvals. Mara Delta is in the process of raising additional capital, following shareholder approval to allot and issue up to 125 513 408 additional ordinary shares at a minimum price of US$ 1.54 per share. 11 080 471 of this issue was successfully placed in December 2016. The proceeds of the capital raise will be utilised to secure the above acquisitions. “Going forward, our focus will remain on expanding our asset base in current countries of operation as well as growing into targeted jurisdictions. “Based on our first half performance, our current assets under transfer and our pipeline, we are confident that with continued shareholder support, we’ll reach our full year distribution forecast growth of 2% to 4%,” concluded Corbett.